Hey, has anyone ever tried going through someone's trash to look for old Super Soakers? We all get desperate sometimes. I can guarantee you that there are thousands of perfectly good blasters to be found there. However, it's a dirty job, and now it's not necessary! The website www.FREECYCLE.org has been set up to organize people in your area who have junk they want to get rid of. Instead of putting it in the trash to take up space in a landfill, they post on local Yahoo! groups that whoever wants it can come and get it from them. Likewise, if someone is searching for an item, they ask if anyone has one they want to get rid of. The rules are that everything must be FREE. Someone mentioned this over at Nerf HQ and a few of us joined up. I posted on the Minneapolis boards asking for Nerf guns or Super Soaker, and within a few days someone emailed saying that they had one that I could come pick up. The top, better condition CPS1000 was what I was given. She also said that if she found her other ones, she would email me so I could come check them out. Now, this is better in larger communities, but there just might be someone that lives near you that is willing to part with their soakers. Might as well give it a try. Good luck! Dang, there are few near where I live. This should work good for people near larger cities. Thanks Janga! cool, my city has over 1000 members! Someone must have a soaker. EDIT: Is it just me, or does the top one look a tiny bit smaller? Take a straight edge and compare. I think it is. No, they are exactly the same except for the extreme bleaching due to the sun. The reason one might look bigger is because of the skewed camera angle. If you look at the angles of the water tank you can see how they aren't in the same perspective. Post anything you get from this service here, I'm interested what turns up. Good luck! Hmm...interesting. I think I'll join the London, UK group although I don't actually live there. Thanks for the tip. man, for a city as big as mine there's barely any people in the group. no soakers there. New York City is only 20 min. from me-theres got to be plenty of people-im going to try this! theres probably no one in my town in the group (pop. 25000). <Edit> I found out there are 95 members in the Bergen County group-I probably can find someone in my town or near it. I can't find out how to actualy send emails and such. You must have a Yahoo! ID and then you subscribe to the group. 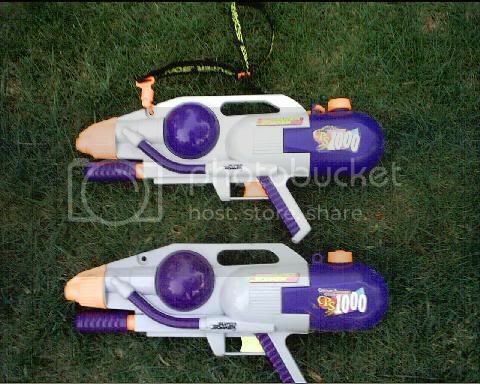 Everything is done via email, you will receive email from people who have Super Soakers if you post an email to everyone in the group asking if they have any. There is a button on the Yahoo! group webpage where you can post want/have ads. It's pretty much explained on the site. Good luck. I joined the one near me. 200 and something mebers, so there is bound to eb someone! Thsi is exciting! I might actually find some more good soakers. My area is XPBackfire-esque, it only has like 80 members and it covers 2 counties. <_< Well that's what happens when you live in a very rural area! You must have a Yahoo! ID and then you subscribe to the group. Everything is done via email, you will receive email from people who have Super Soakers if you post an email to everyone in the group asking if they have any. Wait, you have to have a Yahoo ID? why wouldnt any other email accounts work? Other email accounts do work. The Yahoo ID doesn't just give you email, it also lets you use their groups. You don't have to use their email to use it.